Available May 24. Pre-Order Now! Veteran journalist and critic Chris Morris looks back at his intense half-century-long relationship with the music of Bob Dylan, viewing the role the singer-songwriter’s work has played in his own life. A candid album-by-album exploration of Dylan’s catalog through 2016’s “Fallen Angels” examines the powerful personal impact of the musician’s art. In 2013, Morris – the former music editor of The Hollywood Reporter and a longtime senior writer at Billboard – hit a psychological roadblock as he worked on his book Los Lobos: Dream in Blue (ultimately published in 2015 by the University of Texas Press). Hoping to get his writing flowing again, he turned to the music of Bob Dylan, whose album catalog had recently been collected in a boxed-set edition, and published his thoughts as posts on the blog site Tumblr. It quickly became apparent to the writer and to his readers that the posts were something more than a critical reconsideration of Dylan’s music. Here, Dylan’s music is explored album by album, from his 1962 debut as a folksinger to his 2015-16 explorations of the Classic American songbook; the creative highs and lows of his entire 37-title discography are examined. But Morris’ take on Dylan’s music doesn’t merely weigh the quality of the work – it reveals how a gifted artist’s creations have the power to engage, incite, alter, and even rescue a listener over the course of a lifetime. 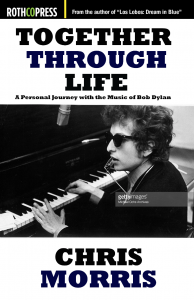 Together Through Life occupies a unique space in the vast bibliography of Bob Dylan books.